States will need to play a role in educating the public and autonomous vehicle developers about safety issues with the new technology, according to a new report. 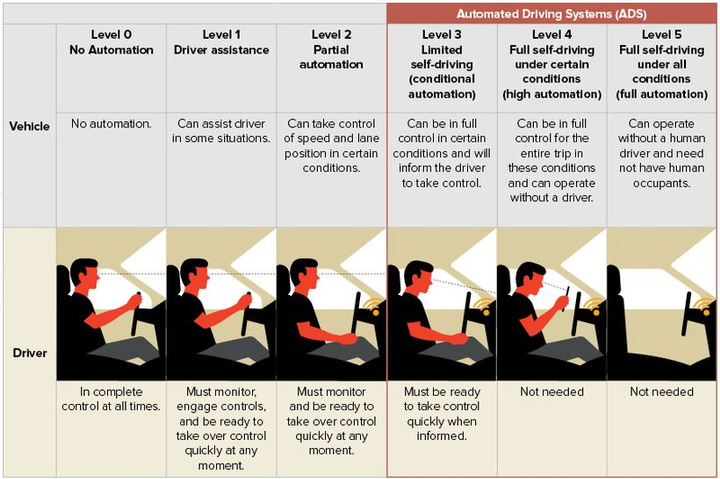 A new report from the Governor's Highway Safety Association (GHSA) highlights the fact that human operators will still exert significant control over autonomous vehicles (AVs) in the foreseeable future, bringing with it a host of safety issues that need to be addressed. For the next several decades, most AVs will share driving responsibility with humans, according to the report, Preparing for Automated Vehicles: Traffic Safety Issues for States. Due to this fact, autonomous technology — that is, anything short of full automation — presents numerous behavioral safety issues connected to how operators and passengers use it. For example, inattention is a critical concern. Operators expected to monitor driving may not do so as diligently as they should. What's more, an operator who does not need to monitor the road for long periods of time may not be able to quickly re-engage if distracted. In addition, unlicensed operators also can be hazardous, as they may be able to activate an AV but be prevented from taking over control of the vehicle if needed. Even jaywalking could cause big problems. If people know that AVs are designed to yield to walkers in their path, pedestrians could opt to literally bring traffic to a standstill — or worse, the vehicle might not stop due to a system error or human error and ultimately, hit the pedestrian. The report also examines questions about seat belt usage, tailgating, and other key safety issues connected with AVs. "States need to consider a number of new issues related to the practical deployment of this technology," said report author Jim Hedlund, a former senior official with the National Highway Traffic Safety Administration (NHTSA). "One of the most important goals should be to educate the public about the benefits and risks of this technology, how to use it safely, and drive near AVs in traffic." Imperfect drivers will continue to pose safety issues when behind the wheel of AVs, just as they presently do when driving traditional cars. In fact, according to NHTSA, approximately 94% of crashes involve driver error. The GHSA report offers states a number of suggestions regarding developing licensing and traffic laws, establishing law enforcement policies and procedures, AV testing and AV deployment.